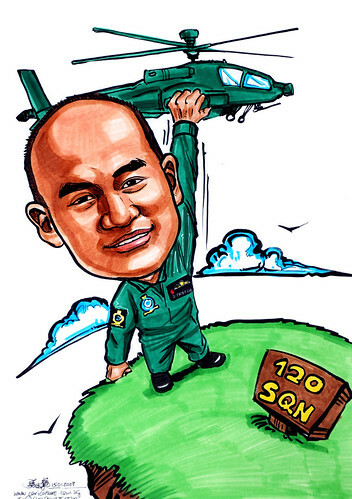 This client used to be my regular, who has asked me to draw many caricatures (think more than 10) for his colleagues when I was drawing in Clarke Quay. I can't remember his face, but knew there was such a customer. Asked him how didhe get to find me again? Thought he will say from Google or Yahoo Search Engines. He said from the url I have written on the caricature. Oh! Some of my clients told me that it looked too commercial, but I believe that they may need it one day. And now it served its purpose (again). The "call code" (is it?! can't remember) is 'stretch' from '120SQN'. The client initially wanted him to stretch out his arms, with the Apache on them. I proposed to have his arm stretched up to reach the Apache. Due to the bird's eye view angle and big head nature of car, the stretch is not really that obvious in this final artwork.